All inclusive resort entertainment. What to expect at your all inclusive resort. It is really what you make of it. You may prefer a romantic dinner a walk on the beach, or your idea is a night of dancing at a disco till dawn the all inclusive resorts cater to your choice. 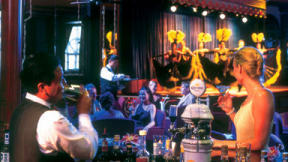 Most resorts feature theme parties. The uninhibited may want to check out the Hedonism resorts for see through Jacuzzi above the disco during one of their theme parties. Evening entertainment centers around bars and discos. Some resorts features local bands in the evening. Be sure to see our click on our what to expect-the extras for a discussion about the all you can drink pluses and minuses. Some all inclusive resorts have casinos. Jamaica resorts are slot machine only casinos. Resorts at Punta Cana, Turks and Calcos, St. Maarten, Curacao, Bahamas, Antiqua and Aruba have full casinos. Although most are small. Don't expect Las Vegas. Mexican resorts do not have casinos.